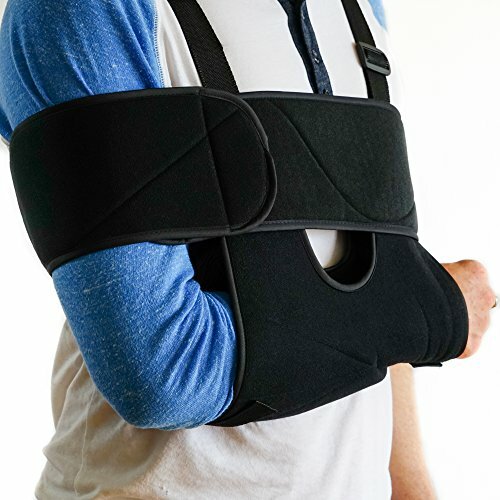 Suffer no longer with our FlexGuard Support Arm Sling. A perfectly engineered brace to stabilize and heal your existing injury whether it be a dislocation, break, or other injury with your arm or shoulder. At last you can let your arm and shoulder heal. Constant movement throughout the day is standing in the way of a full recovery. Let your body be its own doctor by keeping your arm snug and secure. Our comfortable arm sleeve combined with the immobilizer band, guarantees a quicker recovery. With the FlexGuard Support Arm Sling you can be sure to be ready just in time for your next adventure. For any questions or comments, shoot us a message anytime! EXTRA SUPPORT / PERFECT PROTECTION - designed to treat any joint dislocation in your entire arm, shoulder injury, or humerus issue. Holds arm securely in place and provide the perfect aftercare and treatment for your injury. INCLUDES FREE IMMOBILIZER BAND - Strong yet comfortable, our band holds the arm securely to your body. We went the extra mile to support your arm by doubling the protection and stability. LEFT OR RIGHT ARM - Fits left or right shoulder/ arm and is adjustable. BUY NOW!!! - Your satisfaction is guaranteed. For any questions or comments, shoot us a message anytime! If you have any questions about this product by Flexguard Support, contact us by completing and submitting the form below. If you are looking for a specif part number, please include it with your message.